St. Paul’s Chapel (the church on the corner of ground zero which did not get smooshed) is going to have a picnic for the 9/11 volunteers on 9/10. They’re having special services on 9/11 as well, but because this is the 10th anniversary, and Obama is going to be here, security is going to be VERY tight, etc., everyone felt it would be easier to have the picnic the day before. I volunteered to call all the various groups that came to St. Paul’s to help in the volunteer effort to let them know. I’ve got a huge stack of papers for phone calls. I’m going to start with the close states, NY, NJ and CT, and then fan out from there. This morning I’m going to go swimming, take the quickest shower on record, and run to the library. In other words, a perfect day. 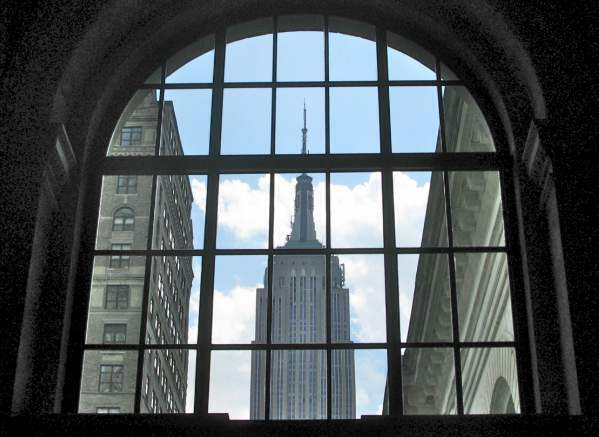 This is a view of the Empire State Building from within the library. I could sit in the library and look at that view all day long. You’re really lucky! I love St Paul’s Chapel. The columns on the front were added several decades afer it was built. The original front door faced the river, when there would have been a spactaculer view of the harbor. I know that you always comment about your photos not being on the professional level but I always think they are spectacular. This is one of my many favorite ones – you definitely have the artist’s eye. Aww, thank you. I always feel like I could have done better. Karen (North Carolina) I wish I could work there! Wow. With the Empire State Building being one of the most photographed buildings in NYC, I am amazed that I haven’t seen this view before. beautiful shot, Stacy! So nice to see a New York icon in a new way. If this was a print, I would buy it. And wow to you!! Thanks for saying that! !